Let's get in to street Art!!!! You must be a member of the Cannes Arts and Good Living Group to attend this activity. Would you like to join this group? Let's gather to discover and share a nice moment around street-art!!!! 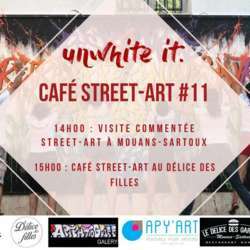 The Unwhite it association proposes us the " café-street-art ". A monthly meeting to make know and discover new talents, to share experiences and have a good time around all kind of street arts. After that we will have a drink and share a nice moment. So if you feel like let it out your artistique side, or just to spend a good moment, come along!!! !